The Aghada clubman will be asked to remain in the hotseat on Leeside. 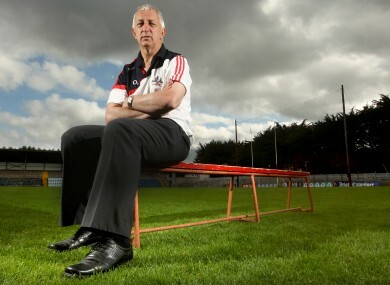 CORK COUNTY BOARD chiefs are set to offer Conor Counihan a new two-year term as senior football boss. The announcement was made at a county board meeting tonight with Counihan also to be given the responsibility of picking his own selectors. It is understood that Counihan may opt to alter the make-up of his back room team which has consisted of Ger O’Sullivan (Dromtarriffe), Peadar Healy (Naomh Aban), Terry O’Neill (Bantry Blues) and Jim Nolan (Castlehaven) since he took over in February 2008. If the Aghada club man accepts the invitation, the county board executive are empowered to rubber-stamp his appointment immediately. There had been speculation over Counihan’s future in the wake of last month’s All-Ireland semi-final loss to Donegal as to whether his five-season reign would be extended. But the proposed new term paves the way for the 2010 All-Ireland winning boss to stay at the helm with the Rebels. Counihan has claimed three Munster titles with the Cork senior side in 2008, 2009 and 2012 along with three Division 1 league crowns in 2010, 2011 and 2012 and a Division 2 league title in 2009. Email “Conor Counihan to be offered new term in Cork”. Feedback on “Conor Counihan to be offered new term in Cork”.